Platelet-rich plasma (PRP) is a concentrate of autologous blood, with 3-4x higher concentration of platelets than in whole blood (Foster, Puskas, Mandelbaum, Gerhardt, & Rodeo, 2009). Platelets, as well as the plasma portion of blood, contain numerous factors that are essential for cell recruitment, multiplication, and specialization and are required for healing. These factors include proteins, cytokines, and growth factors, all of which aid in regulating the healing process (Castillo, Pouliot, Kim, & Dragoo, 2011; Cavallo et al., 2014; Foster et al., 2009; Fu, Sun, Bi, Wang, & Yang, 2017). When platelets come to an area of injury, they undergo degranulation, expelling these substances, aiding in the healing process by stimulating cell proliferation, chemotaxis, angiogenesis, and cell differentiation. Platelets also release histamine and serotonin, which increase local capillary permeability to improve access for additional inflammatory cells to start the reparative process (Sheth et al., 2012). There is growing support for the clinical use of platelet-rich plasma, because it is created from a patient’s own blood, and considered to be a relatively low-risk treatment with the potential to improve or speed healing by delivering necessary cytokines and bioactive factors to the injured area (Kesikburun, Tan, & Yilmaz, 2013) In this case, the Arthrex Angel advanced PRP processing system was used to obtain PRP for a shoulder injection. 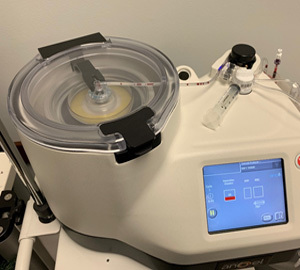 This system produces a customized cellular product by using 3 specific wavelengths of light to more precisely separate cell types after centrifugation (“Arthrex Angel® cPRP and Aspiration System,” 2018). AB is a 55- year old female with 6-year history of left shoulder pain. Patient describes her pain as constant, and states it alternates between a dull ache and sharp stabbing sensation. She rates her pain as a 3/10 at rest and a 7/10 during and after activity. Patient reports left shoulder tenderness, weakness nocturnal awakening due to pain. The patient is an avid athlete with daily training in weight lifting, rock climbing, and long-distance running. Most recent left shoulder non-contrast MRI revealed Moderate Grade interstitial insertional tear of the posterior fibers of the supraspinatus tendon and a small amount of fluid in the subacromial and subdeltoid bursa. Patients physical exam is pertinent for full AROM with pain during flexion and horizontal abduction, + Hawkins, + Neers, MMT: IR 5/5, ER 4/5, Supraspinatus 4/5. The patient has tried numerous conservative treatment methods, including, NSAIDs, rest, physical therapy and 2 corticosteroid injections in the SA space. Patient was not interested in surgical intervention at this time and presents to clinic for an PRP injection using the Arthrex Angel System. The patient’s peripheral blood was drawn via a standard arm venipuncture through the median cubital vein. 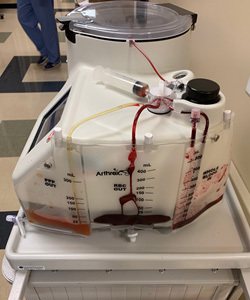 The total anticoagulated whole blood (WBA) volume obtained was approximately 110 mL Anticoagulant citrate dextrose, solution-A (ACD-A) was added to the blood and the sample was then inserted into the system. The Angel unit was set to 40 mL whole blood volume and hematocrit of “PRP” product was set to 15%. The blood was spun in the centrifuge for 8 minutes, and a new syringe was loaded with the platelet rich byproduct. The site was cleaned, and the supraspinatus tendon and injection site were located using ultrasound guidance. The injection was administered directly into the area of localized inflammation on the posterior fibers of the supraspinatus tendon. Post-injection, the patient complained of mild discomfort at the injection site but denied exacerbation of existing symptoms. Patient returned to clinic 2 weeks post PRP injection feeling better overall. Patient has been able to increase her activity level with no pain. Physical exam revealed full, pain free AROM, - Hawkins,- Neers, MMT IR 5/5, ER 5/5, Supraspinatus 5/5. Repeat US exam revealed decreased supraspinatus inflammation compared to images two weeks ago. 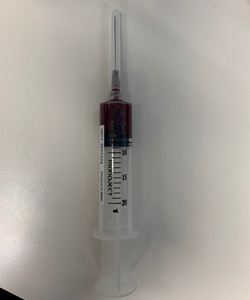 For this patient, PRP injection using the Arthrex Angel system proved to be a successful intervention to treat her chronic shoulder pain due to RTC disorder. PRP is a viable treatment option for many patients and should be offered to those who fail multiple conservative treatments and do not wish to have any surgical intervention. Arthrex Angel® cPRP and Aspiration System. (2018), 56.